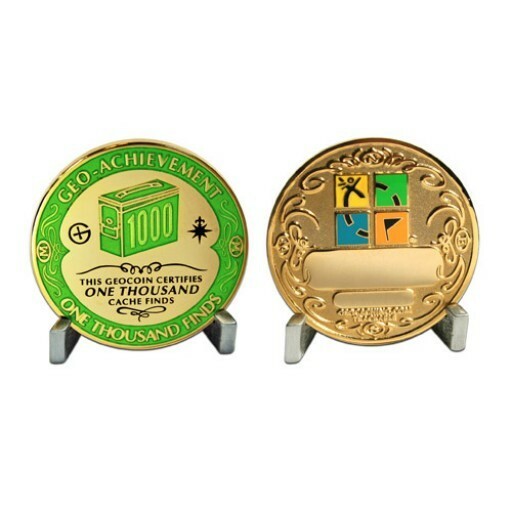 This elegant 1000 Geo-Achievement award set is plated in 24K polished gold. It is perfect for awarding to your friends or family for their geocaching achievements. Use the included matching pin to wear at events or use the accompanying stand. Give this Geo-Achievement Award to the deserving cacher who has reached a great milestone in cache finds. The 1000 finds coin set includes a coin stand and lapel pin so the bearer can proudly display their geocaching achievement.